–Zelda Sayre Fitzgerald, in a letter to her husband dated March 1934. The Paris Marathon was on Sunday (12 April 2015). I had entered the lottery for the race a year ago. I registered on April 28, 2014, not 24 hours after crossing the finish line of Big Sur. I had big plans. I was hoping to BQ (qualify for the Boston marathon). Plus, Paris. I was hoping that the study travel course on the Americans in Paris that my colleague and I were planning would make, so I would already be there, taking care of the most formidable part of the logistics: the plane ticket. And then I broke my foot. At approximately 9:30 AM on July 31–KAPOW! I’ve written elsewhere about dealing with my stress fracture, so I won’t repeat myself here. My orthopedist gave me the okay to begin training for the race in mid-November. I was starting over again with the Couch to 5K program. I followed the program in terms of workouts, but I bumped up their frequency, completing the 8 weeks in 5. I began the 18 week training cycle a little late, so my coach Katie Kellner with Hanson’s Distance Project modified it a bit to fit with the timeline for Paris. Early on, I decided to be conservative (or as conservative as you can be while training for a marathon coming off a stress fracture). I abandoned the BQ goal, abandoned any time goal, really. 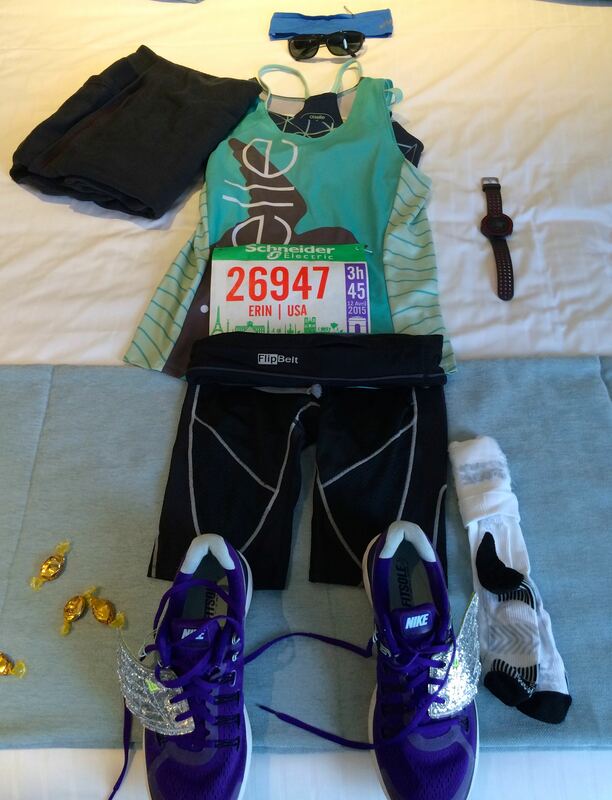 I wanted to make it to the start healthy even if that meant I was slower on race day. That means I did no interval training, speedwork, or tempo runs (all of which would increase the risk of injury). All of my runs were “easy pace” with the aim of simply increasing my base mileage over the 16 weeks to the marathon. The training circuit was rocky, not because of the physical demands, but because I was running scared. Mostly, I was afraid of reinjury. But I was also afraid of failure. Every week, something else hurt. In the beginning, it was the site of the stress fracture. Then it was the bunion. One week it was my IT bands. Another, it was shin splints. Finally, it was a calf strain. But nothing was triggering the 3S red flags (sudden, sharp, severe), so I kept going, through the doubt, through the fear. I hit all of my workouts, which was just about logging the miles. It was kind of nice not to worry about how fast I was going–as it turned out, I was remarkably consistent. I listened to LOTS of audiobooks. I trained early in the morning. Partly this was because of my schedule. But partly it was because of my fear. I wanted my running to be less public in case I broke my foot again or did something else to land back on the couch. My brain said that nobody in my life would say “I told you so,” (well, except for me–I am my own biggest critic, which should come as no surprise to anyone who knows me), but even so, the cover of darkness lessened the stress a bit. I made it through the training plan but by the end, my legs were feeling really beat up. I entered the taper with doubts and the taper did nothing to alleviate them. In fact, it magnified them exponentially. Traveling across the globe didn’t help. Nor did all the walking we did through the streets of Paris in the week before the race. If I wasn’t eating or sleeping, I was standing or walking. I cut back on the running I was supposed to do the week of the race. What little running I did was bearable, but just. My hamstrings were tight. My calf hurt. One of my toenails got a blister under it & needed periodic draining. I woke up in the middle of the night with a panic attack, and my doubt intensified. And though I had brought my trigger point foam roller with me, the hotel room was to small to actually use it. I began to make my peace with a DNF (did not finish). I decided that I would start the race, and I would give myself 5 or 10K before making any decisions, but I also decided that I would be okay if I didn’t finish the race. I decided that I would likely drop out and metro back to the hotel at some point. The thought of running for upwards of five hours on sore legs was not appealing, and I was really scared of reinjuring myself. I emailed my coach, who encouraged me to put the DNF out of my mind and cross that bridge if I came to it. I was also texting and emailing with the awesome Kathy Harris, who listened to my freakouts and talked me down from the edge at least 4 times. I told my mom, “I think the race is going to be ugly.” I told my colleague, “I will probably not finish.” He asked, “Are you okay with that?” And the truth is, I was. He asked how a DNF would be different from not racing at all. I explained that the difference was the choice. Not starting because of injury was worse to me because I didn’t have a chance to decide. DNF felt better because I could try. Something about being able to make the decision to stop was empowering to me. I promised myself that I would drop out rather than end up on crutches again. I went to the expo on Thursday afternoon. Or rather, I tried to go to the expo on Thursday afternoon; I didn’t get there until Thursday evening. I took the Metro to Parc des Exposition, which was a 45 minute ride almost all the way to the airport. I got off the train at my stop and looked around. No signs. No people who looked like runners. Not many people at all, actually. I wandered around a little bit. Nothing. I finally got out my phone and looked up the expo in FB. I was in the wrong place. Way, way out in the wrong place–45 minutes on the metro in the wrong direction. So I took the metro back & finally made it to the expo, which luckily was still open for another few hours. It was huge. And empty. I turned in my medical certificate and got my convocation form stamped. 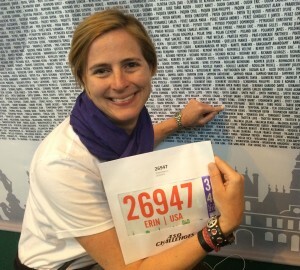 I picked up my bib. 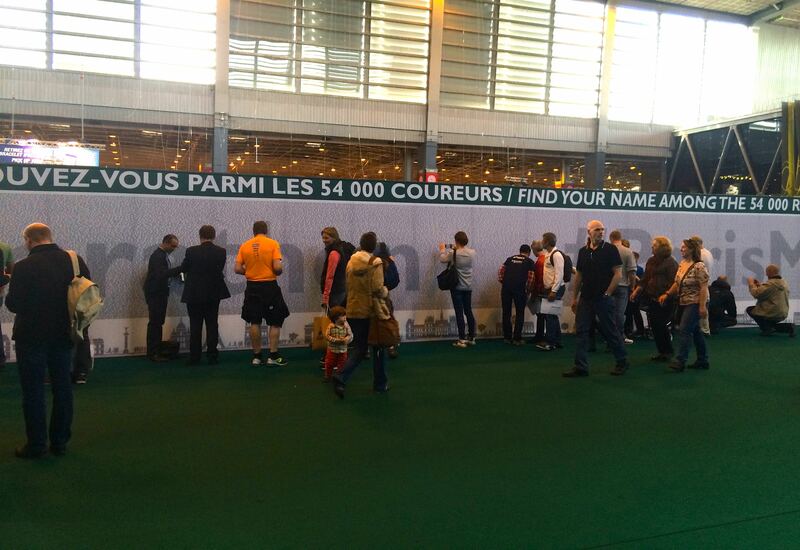 I saw the wall with the 50K names of all the runners. That was cool, and a little overwhelming. I found my name. I took a picture of it, and then a nice guy who was also there by himself took my picture with my name. He told me to hold up my number in the picture (he didn’t speak English but had obviously done this before), and then I took his picture in return. We wished each other a good race and moved on to the next station. I picked up my swag bag, and then it was into the ASICS store. When I was at Big Sur last year, I was very superstitious and couldn’t bring myself to buy anything that had the words “official finisher” on them since I hadn’t actually finished anything yet. 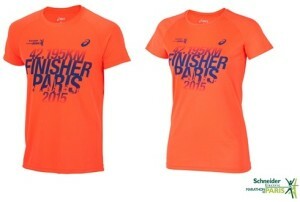 Paris eliminated that conflict–they didn’t have “official finisher” merchandise for sale–you had to earn that shirt (though they did have it on display). I wasn’t a fan. It’s really bright reddish-orange with blue lettering (picture down below). The race merchandise they did have for sale was much more my style. I bought a couple shirts (one short-sleeve & one long-sleeve). I figured that I probably wouldn’t get the ugly finisher shirt, so I felt okay buying the not-ugly gear. I reasoned that after everything I had accomplished, I had earned it even if I didn’t finish the race. I also bought a headband made of coolmax fabric, which I ended up wearing during the race. I then went to find the Breakfast 5K stand, which took me forever. It was tucked back before the ASICS store, and I had walked right past it. Before my legs went to hell, I had signed up for the Breakfast 5K, which was held on the Saturday before the marathon. It was at the Eiffel Tower, and it was a low-key shake-out run. I was supposed to run 5K that day anyway, and I thought that this would be a good warm-up for the next day since I don’t usually run in huge crowds. There was an impressive display of running companies at the expo: Garmin & Polar, all the major shoe companies, lots of European brands that I didn’t know. . . but I really just wanted to get my breakfast shirt (you couldn’t do the run unless you were wearing the shirt) & get back to the hotel. I finally found the stand after wandering for more than 45 minutes, and I was finally able to leave. As it turned out, I decided not to do the breakfast run. I ran 5K on Friday and decided that I would rest on Saturday since I hadn’t had a chance to really do that at all since arriving in Paris. It was the right call. I checked out of the old hotel and hung out at the Costa Coffee across the street for a few hours–wifi and bathroom!–and when it was time, I made my way to the new hotel, which was over near the Champs-Elysees. I have decided that I really don’t like the Champs Elysees–it’s a lovely street, but it’s enormous and always really crowded. I don’t like crowds. Probably most people don’t like crowds, but I *really* don’t like crowds. 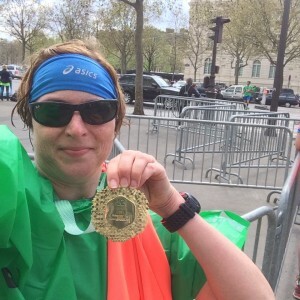 But it was where the race was starting, and a friend who ran Paris a few years ago advised me to minimize logistics and stay as close to the start as possible. It was really good advice. I hung out in the hotel on Saturday except for the hunt for dinner. Side-note: Paris is a wonderful place to carb-load, and I took full advantage of the baguette! So many baguettes!. My pre-race dinner: a baguette & pain au chocolat. Not all in one sitting. Well, technically, I guess it was all in one sitting since I spent the whole evening sitting, but I basically ate the bread over 3 or 4 hours. I also laid out my gear for the next day. It was going to be almost 50 at the start (it was actually 46 when I left the hotel), so I knew I wouldn’t need my arm sleeves. Flat Erin is wearing Verrazano, CW-X tri-shorts, Zoot socks, the ASICS headband, my Oiselle singlet, and the Nike LunarEclipses that I had worn at Big Sur. I also wore a FlipBelt, which is seriously the most awesome race belt of all time. The Flipbelt carried 8 Gu (salted watermelon & salted caramel), money & metro tickets so I could get back to my hotel in the event of DNF, my phone in a ziploc, a chapstick, a 2Toms anti-chafe wipe, a sponge for the water stations (to cool down), and a few Wether’s candies. The large square in the upper left may be an airline blanket that I took to use as a throwaway on race morning. I took a hot bath and watched several episodes of LOST (I wanted to watch ALIAS, but it’s not streaming anywhere!). The next morning, I woke up at 6, after actually getting a decent night’s sleep. I had a Mojo bar and some tea. I took another hot bath to loosen up my calf and the rest of my legs. Sunscreen and anti-chafe lathering commenced, and then I got dressed and ready to go. I left the hotel and walked the 5 minutes to the starting area. My corral, based on my anticipated finish time last year, was 3:45, and since you couldn’t change it, I just went to the back of the corral and hung out there. It filled up over the next 20 minutes or so. I took a couple pictures before putting my phone back in the ziploc for the duration. The field was 75% percent male. This was most evident in the lack of porta-lets. The guys could (and did) go wherever. The women had fewer options. But I was okay. That was one good thing about having a hotel room 5 minutes from the start. I brought a bottle of water with me to drink for the first few miles. As the time drew near, I got rid of the blanket (which was a stroke of genius if I do say so!) and the trash-bag-like poncho that they had given us at the expo. The race must have started because people started to move slowly up towards the start. My corral was supposed to start at 9:15, and as far as I can tell, we pretty much did. The first part of the race was down to the Place de la Concorde (what I had been calling the “obelisk” all week long. It was on cobblestone. Not the truly terrible round ones, but still cobblestone. I was less than thrilled about this, but there was nothing to be done except run over them to the get to the pavement. We rounded the Concorde monument and proceeded on to the Tuileries. I thought about our visits there earlier in the week, about Mom and the students who were with us. About the cafe we visited and the waitress who kept ignoring Izzy. About the metro stations and the ring scammers. We kept going past the Louvre and on towards the Bastille, and the 5K mark where we would hit the first aid station. I really liked that the race was marked in km (there were also mile markers) because they kept coming up, and I felt like I was making progress. Even though a marathon is 42km and change, it seemed less daunting to think in km terms. My first few miles were slow and easy, which was the plan. And though my hamstrings were tight, everything else felt ok, definitely no worse than earlier in the week. I grabbed my bottle of water and kept going. The aid stations in France were intense. Lots and lots of bottled water (some bottles had the caps on and some didn’t–I preferred those with cap so I could drink the water over the 5k to the next station) and aggressive runners. They also had oranges and bananas. Which meant the course was littered with orange and banana peels. There was an open fire hydrant just past the aid station on the course, making it rain over the entire road. The water was surprisingly cold, but it felt pretty good despite making it impossible to see out of my sunglasses for a few minutes. I felt pretty good, so I decided to go on to the next aid station. Where I grabbed another bottle of water and kept going. On to the next. And so on. I took a Gu before every aid station, and I drank the whole bottle of water every time. I was getting passed a lot, but that was fine. Even on my best day, I get passed a lot in the first part of a race. I am a second-half runner. I always have been. So getting passed didn’t freak me out; I am used to it. I felt ok, so I kept going. I was listening to my iPod ( after the second fire hydrant, I was glad that I opted for the waterproof one), and the music was a nice distraction from the constant crowds on the course. The course was very congested especially when it narrowed to a single lane, which happened fairly often. 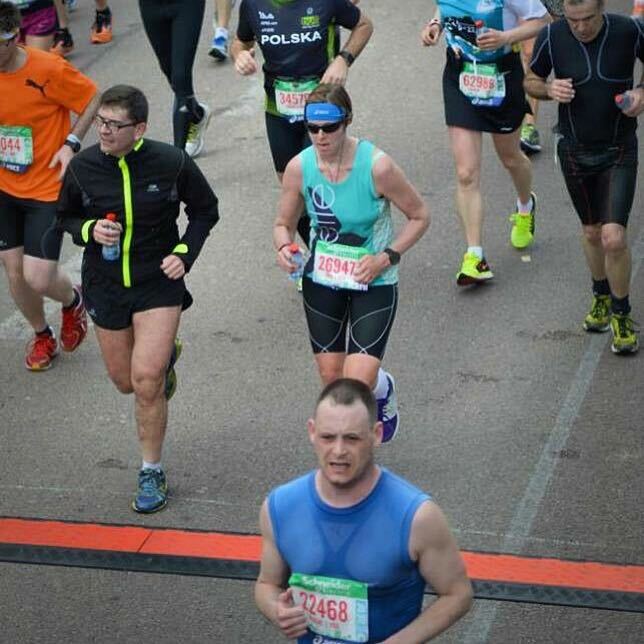 In the other big races I’ve run, the congestion only lasted for the first few miles before opening up, but in Paris,that never happened. The crowd was constant. Sometimes the crowds were more dense than others, but it was always crowded. The congestion started to become more of an irritation once I got to the halfway point. Partly, this was because I started to catch up to people who had started too fast. Partly it was because I started to think that I could actually finish the race, that I could get one of those ugly shirts and earn one of the not-ugly medals. My spirits, which were good began to rise, and I picked up the pace a little. I started to pass people instead of being passed. My confidence began to return, and I began to get a bit emotional. I almost bit it twice, both times thanks to speed bumps that I found by almost falling onto them. But I managed to stay upright, which is good, because I would have gotten totally run over–literally–if I had actually hit the ground. My favorite part of the course was the road next to the river in the second half. The last few miles were through another park. We ran past the Eiffel Tower and also past Notre Dame, though most of the view of ND was blocked by buildings. We also ran past Roland Garros, which wasn’t as scenic but which flashed me back to 1993 when on my first trip to Paris I went to the French Open with my travel-buddy Jill, who was a huge tennis fan. My legs were very tired by this point, but I knew I could finish the race. There were a lot of walkers on the course by now, and it was still crowded, but I kept going and maintained my pace the best I could whilst weaving around everyone. 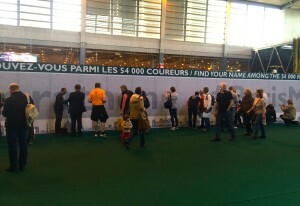 There were signs saying that they would be taking pictures for the 41km Tag Heuer promo (they would post to FB if you allowed it), but I didn’t see the cameras. I did see most of the regular photographers on the course (the neon orange shirts that they wore helped!) You can see one of the many water bottles I carried in the photo. Finally, we came out of the Park and around the final turn (on those blasted cobblestones! 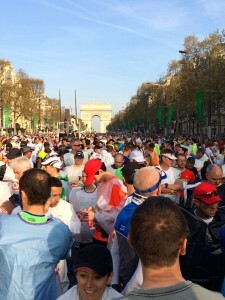 ), and then the finish line loomed and behind it in the distance, the Arc De Triomphe. I finished with an official time of 4:09:18, which is some 15 minutes slower than Big Sur, but considering that I didn’t think I would finish at all earlier in the week, I was pretty happy. After crossing the line, I made my way to the water station to get more water (it was around 70 degrees and sunny, so I knew I was dehydrated despite all the water I had consumed on the course). I then got my ugly shirt (the photo below totally doesn’t do the color justice! It actually glows) & the finisher poncho. I also grabbed an apple and a half banana. And then I finally got my finishers medal. I proceeded to waddle down the finisher chute passed the bag checks. I had packed a drop bag, but I left it at the hotel. I wasn’t at all sure I would finish, and I didn’t want to have to deal with retrieving it after dropping off the course–plus, my hotel was close enough that I figured if I did finish, I could make it back to the hotel with a change of clothing. Bag check is much more important if you can’t just leave when you are done and will be hanging around in wet clothes for a while–I was on my own so I could leave at will. It was a longer walk from the finish back to the hotel, but by longer, I mean 20 minutes instead of 5. I had read more than once that after finishing a long race, you should walk as much as possible to minimize soreness in the aftermath. So walk I did (though the word “walk” might be stretching things a little bit). I stopped to take a selfie (above) with my medal. When I made it back to the hotel, I took a cold bath. Then a warm shower since I was still pretty grimy, then another cold bath. I put on my compression tights to assist in the recovery effort, donned my ugly shirt, and made my way down to find some food. It was Sunday, so lots of the smaller places near the hotel were closed. I stopped at Marks and Spencer and bought an egg sandwich in case I couldn’t find pizza, but then a few minutes later, I found an Italian pizza place on the Champs Elysees and went there. The pizza was good. I also stopped at a patisserie on the way back and bought some macarons and a beignet (avec framboise!). It was a lovely day, but I was tired, and my legs were sore, so I made my way back to the hotel and hung out there for the rest of the day. It’s still hard to believe that this thing which I had been aiming for since April 2014 has come and gone, and that I actually was able to accomplish the goal that seemed pretty far out of reach at several points along the way. I spent the next day walking around Paris as much as my tired legs would allow, which was, as it turned out, a lot. I ate my final baguettes (the sandwiches this time, not the entire loaf of bread) and I packed my bags. In the morning, I took a taxi to the airport (the thought of a minimum of three metro transfers with all my luggage and my sore legs made me weep), and I had an entire middle row (4! seats!) to myself on the flight home. Up next: the Peachtree 10K, the Scream half-marathon, and then in February 2016, the LA Marathon. And hopefully no stress fractures in the interim. So proud of you, honey! Great stamina and determination! Sounds like it was a little bit fun, and such impressive scenery! I just started the C25K program for my 4 time as I’ve never been able to finish it. Life happens you know. Anyway, this time around I am determined to complete it and reading. Your story is truly inspirational Erin! Way to go and bon courage!!! Congrats ! Truly enjoyed reading the recap. I have signed up for 2016 and this gives a lot of great tips and ideas. Several people have mentioned speed bumps…. will definitely be on the lookout ! amazing all you (your body) had been through before actually even starting the race. chapeau for finishing!!! !